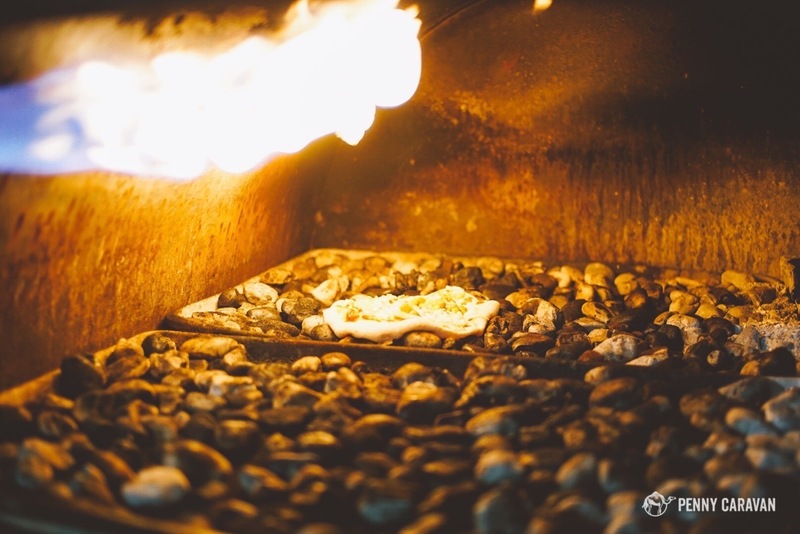 The complex and rich history of the Holy Land has bred a cuisine to match. Centuries of successive conquerers have added their flavors to the mix, and returnees from the Jewish diaspora have also brought with them traditions from their lands of exile. 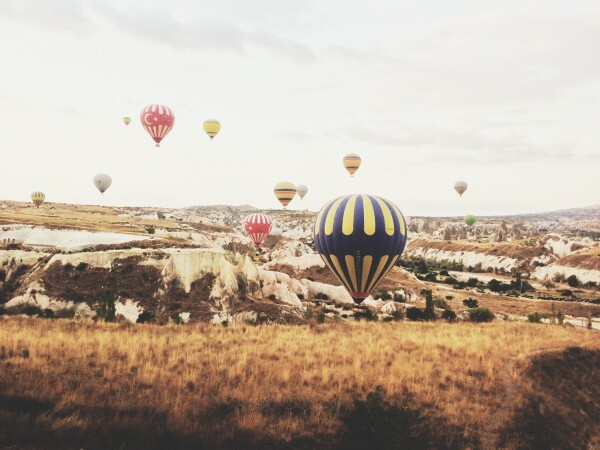 That means it’s hard to nail down what exactly constitutes the national cuisine, so if you’re a fan of variety, expect a myriad of tastes that are both contradictory and complimentary. 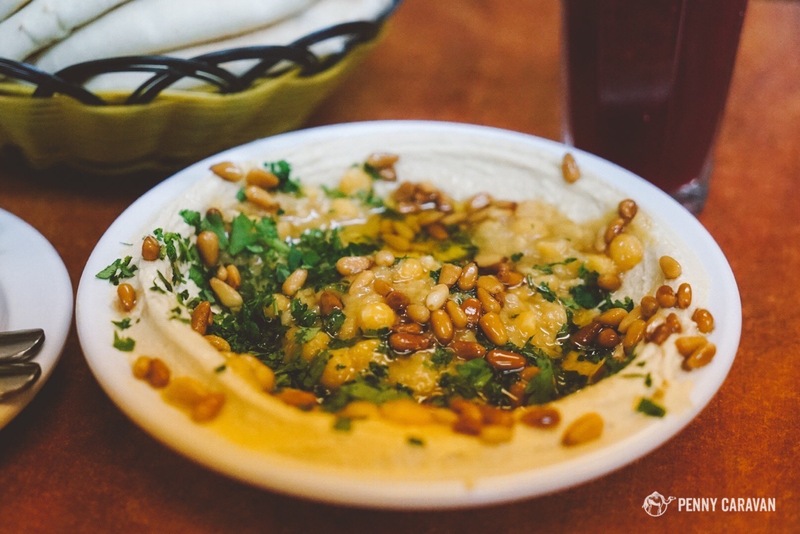 Home to numerous cafes and family run restaurants, the narrow streets of the maze-like Old City are home to some of the best hummus in Jerusalem. The aroma of freshly fried falafel will lure you in, and you’ll welcome a few minutes of respite from the crowded streets. 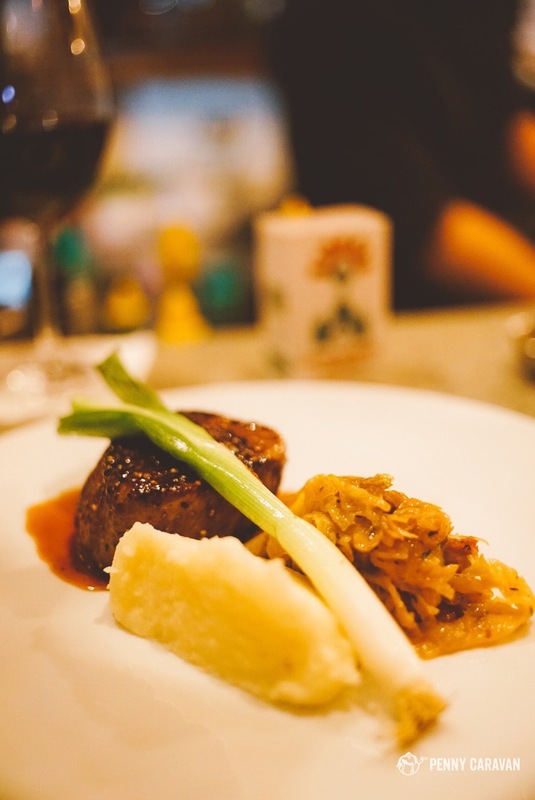 You’ll be spending a lot of your time in the Old City, and the good news is there are plenty of places to treat your palate without draining your wallet. 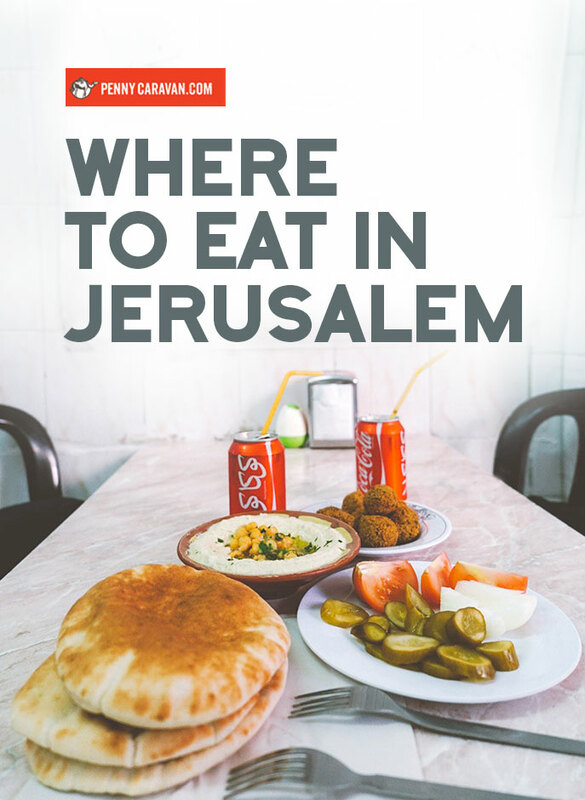 Although you can certainly make a meal out of any stop, I’d recommend just snacking and sharing, so you can visit more spots and determine for yourself who truly wears the hummus crown. Abu Shukri makes a strong claim, and its location between the 4th and 5th stations along the Via Dolorosa makes it a good resting point. Lina Cafe offered a variation with pine nuts, and the fresh-squeezed pomegranate juice is rejuvenating in the midst of a long day of pavement pounding. 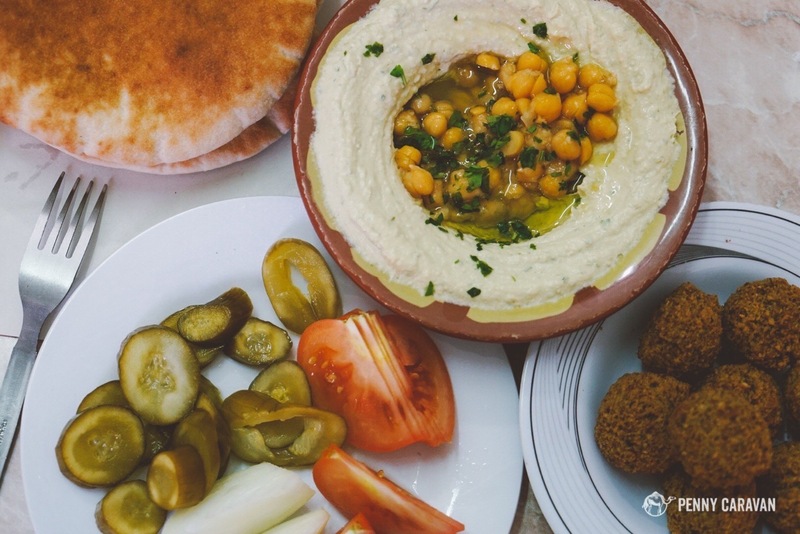 40 shekels ($10) is enough for a filling serving of hummus and falafel for two, with drinks. 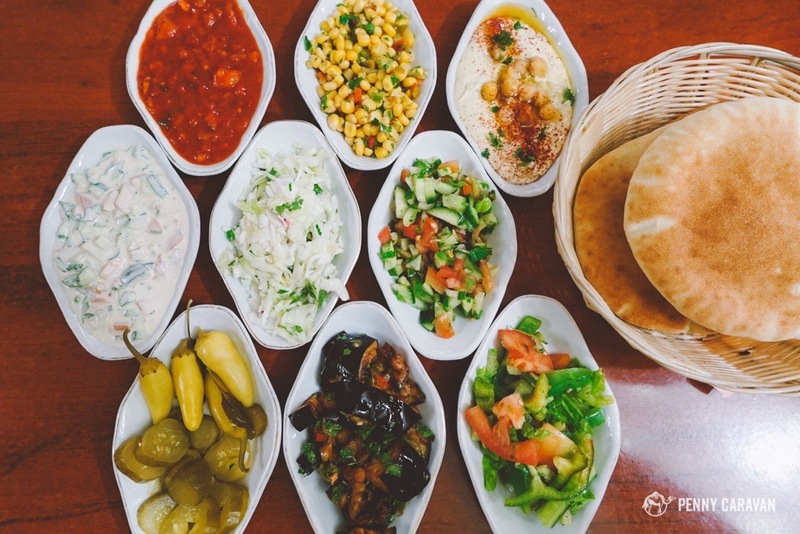 Families Restaurant (yes, that’s the name), along the main thoroughfare of Khan Al-Zair, offers a fuller menu than most of the hummus joints in the Old City. We feasted on shawarma and split the “small” salad (see picture). 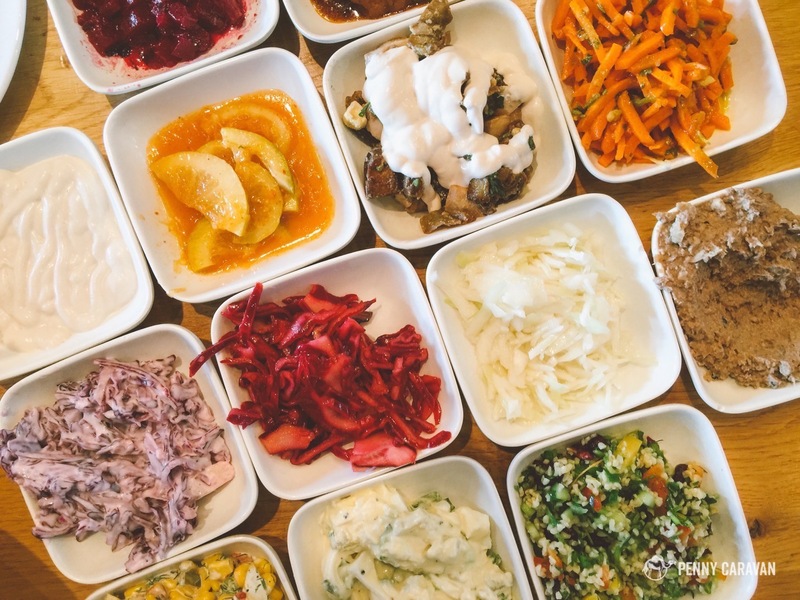 We absolutely love mezze-style Arabic salad, which lets you sample many different flavors. We got more than we could eat, plus drinks for less than 80 shekels ($20). 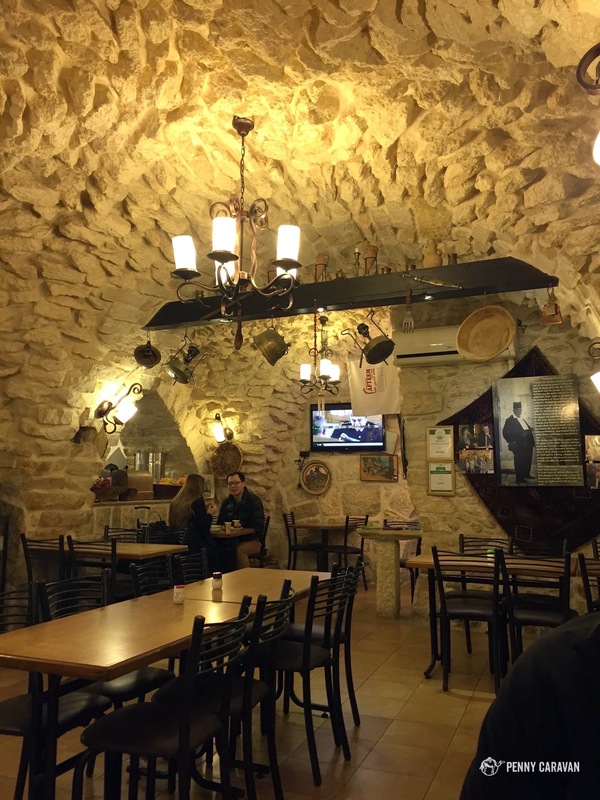 If you tire of hummus, we can recommend Jacob’s Pizza, near Jaffa Gate. Served by the slice, there are plenty of options for a reasonable price. 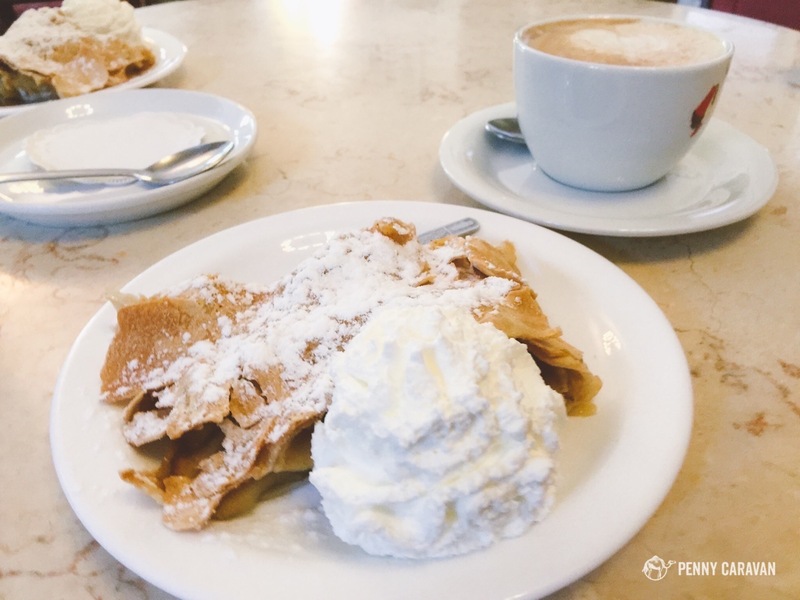 And if you happen to be looking for breakfast in the Old City, the Austrian Hospice along the Via Dolorosa is a good spot for a latte and apple strudel. Hummus and falafel at Abu Shukri’s on the Via Dolorosa. Having mint tea in the cotton souk just outside the Temple Mount. 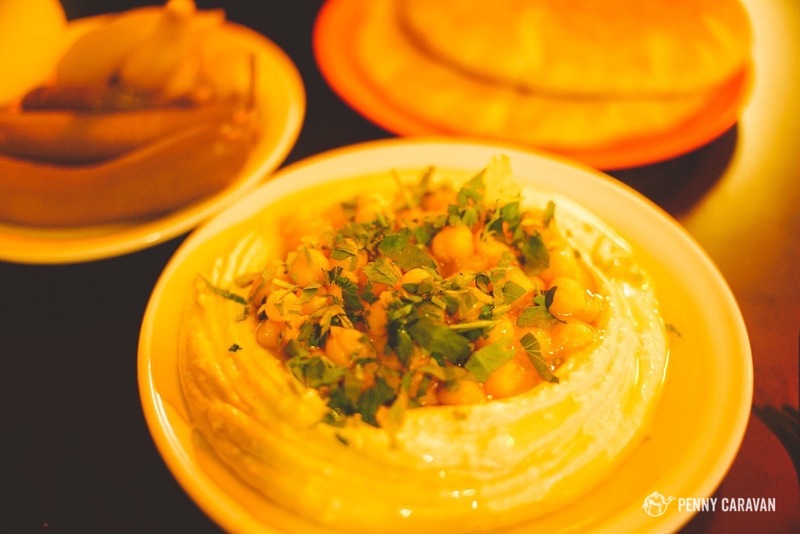 The hummus at Lina Cafe had pine nuts. Be warned: this is the “small” appetizer at Families Restaurant. It was enough for a meal for two! The apple strudel at the Austrian Hospice on the Via Dolorosa. 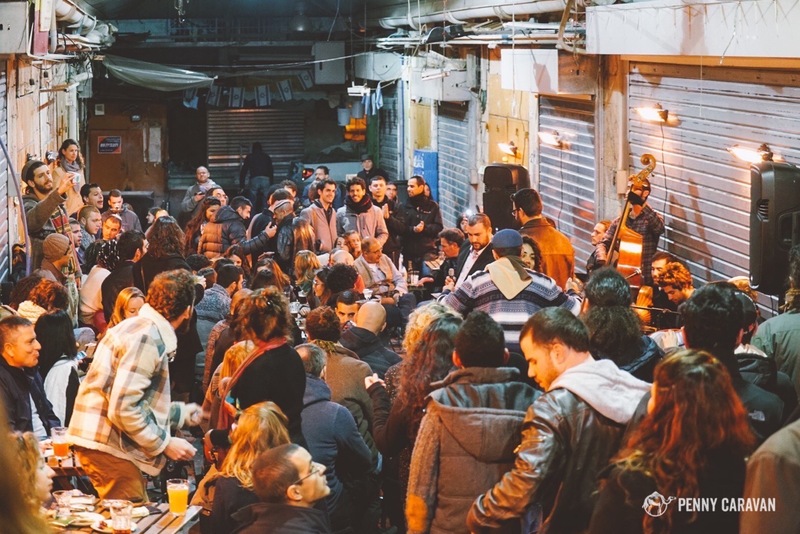 We found ourselves in Mahane Yehuda on an almost nightly basis. 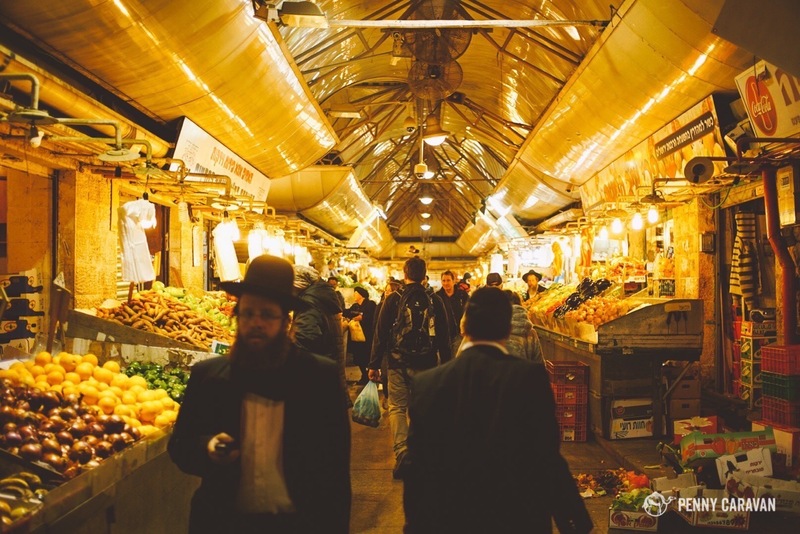 By day, “the Shuk,” as it is referred to, is a market for fresh produce, kosher meats, and baked goods (be sure to pick up some snacks to take back to your room for late night cravings). At night time, the market transforms into a hotspot of restaurants and taverns with live music performances a common fixture. 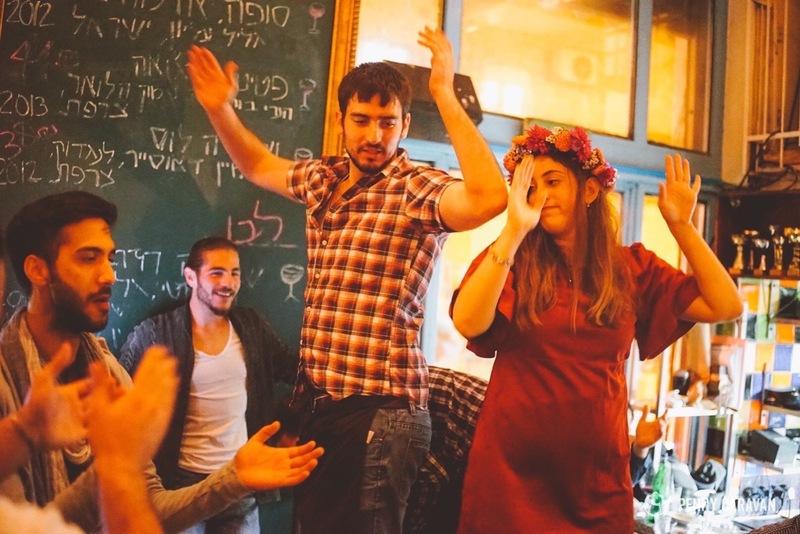 After a long day maneuvering the streets of the Old City or ascending the Mount of Olives, Mahane Yehuda was a great place to have dinner and mingle with locals while jumping from tap to tap. Accessible via the light rail, you’ll find enough choices to keep you coming back night after night. Azura restaurant, tucked in a back alley of the market, serves up Kurdish-influenced meals with hummus rivaling anything we had in the Old City. 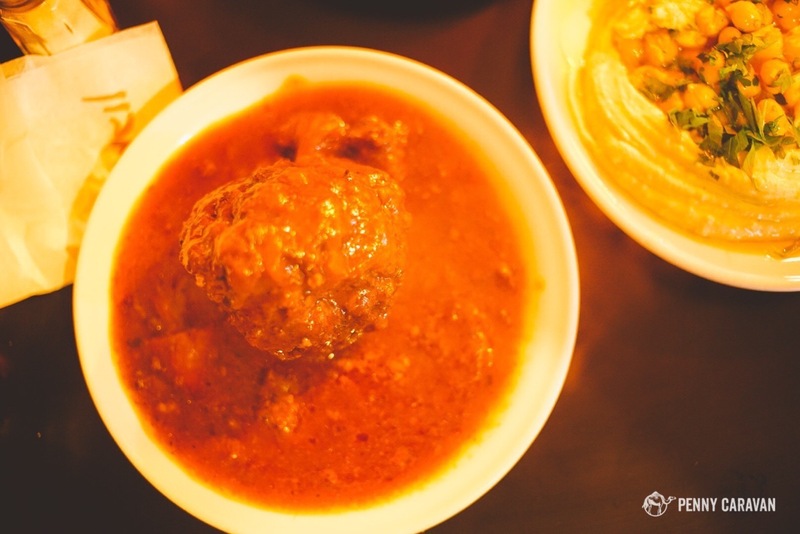 I enjoyed a meat ball in tomato sauce, and Iylana had a kubbeh soup. The next night we checked out Pasta Basta, where you can build your own bowl by checking off various options. And on another night we feasted on shakshuka, a delicious egg and tomato sauce dish that’s good any time of day. All meals ran us between 40-80 shekels ($10-20) for both of us. For our last night we splurged at Machneyuda, which serves up culinary creations with ingredients from the market. I had filet mignon while Iylana had a dish inspired by ghormeh sabzi, a Persian stew with which we are familiar. It was nothing like actual ghormeh sabzi, but was tasty nonetheless. The tab here was decidedly more expensive, but it was pretty much our only splurge of the trip. 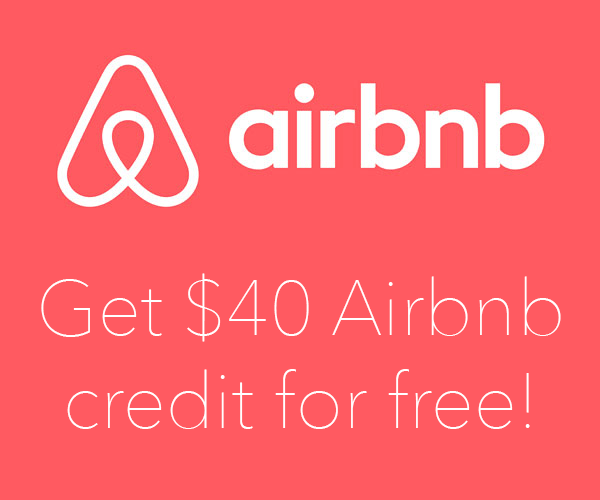 Have your hotel call ahead for a reservation. As for the numerous taverns in the Shuk, we found ourselves frequenting Cafelix, which served up espressos alongside alcohol. But there are definitely plenty of choices for libation around every corner. When closed, the restaurants display the work of local muralist Solomon Souza. The meatball and hummus at Azura. 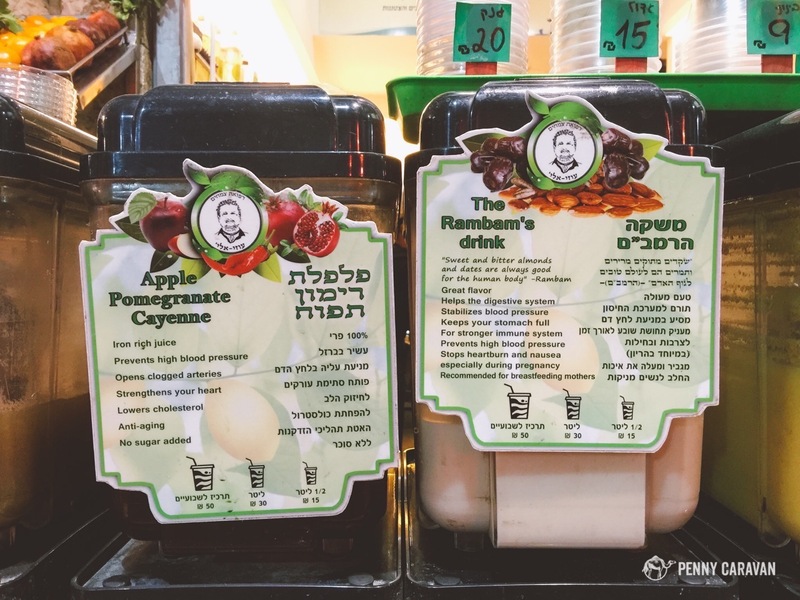 The Etrog Man’s shop has lots of juices and health drinks. 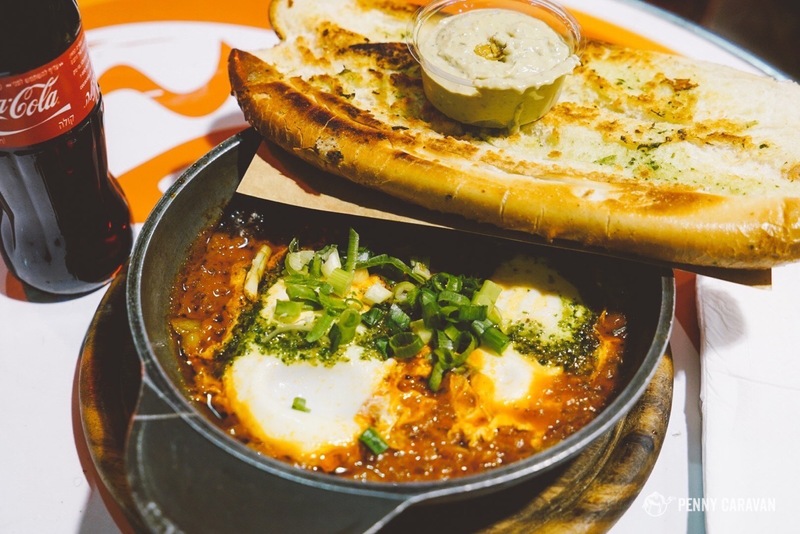 Shakshuka is a legit meal for breakfast OR a late night snack. Live music set up between two of the bars. Dancing on the tables at Machneyuda. 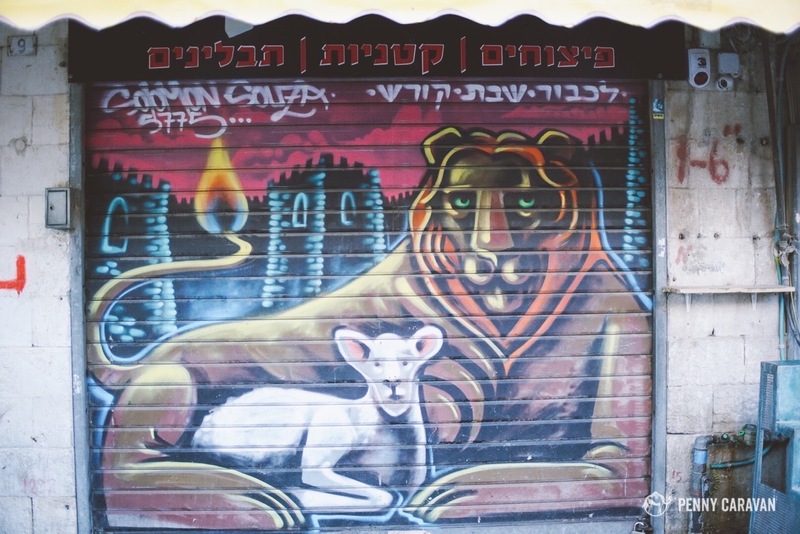 The newer construction in Central Jerusalem also has plenty of eateries, though we didn’t venture there too much due to the plethora of choices in the Old City and Mahane Yehuda. There was a mall within walking distance of the Crowne Plaza we stayed at, which provided us with a couple of options. First was Tzipora’s, a chain restaurant that served up various kebabs. The highlight was the unlimited Arabic-style salads. A full spread of 15 was brought to us and we were able to order more of the ones we fancied most. Cafe Greg, another chain, offered up shakshuka for breakfast, though be advised, it was nowhere near as good as the shakshuka we had in the Shuk (chains, pfft). The unlimited refill appetizer at Tzipora’s. 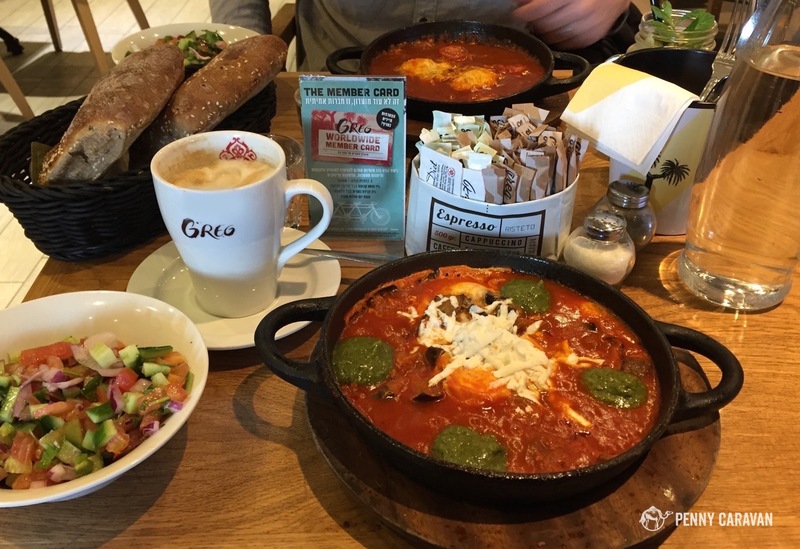 Shakshuka, salad, amazing bread and coffee at Cafe Greg. 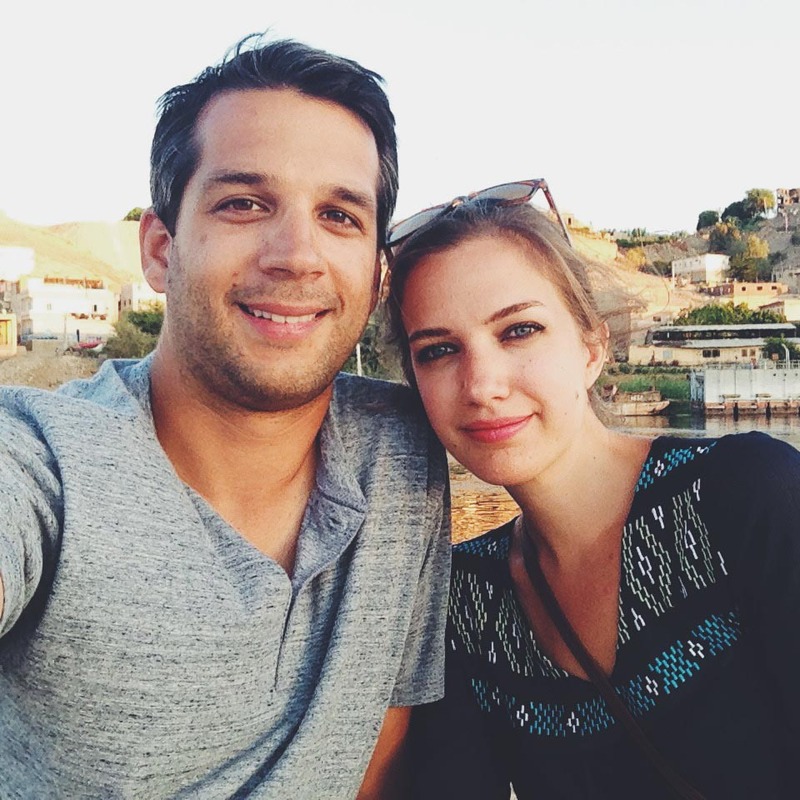 Our only foray into the Palestinian West Bank was Christmas Eve in Bethlehem. 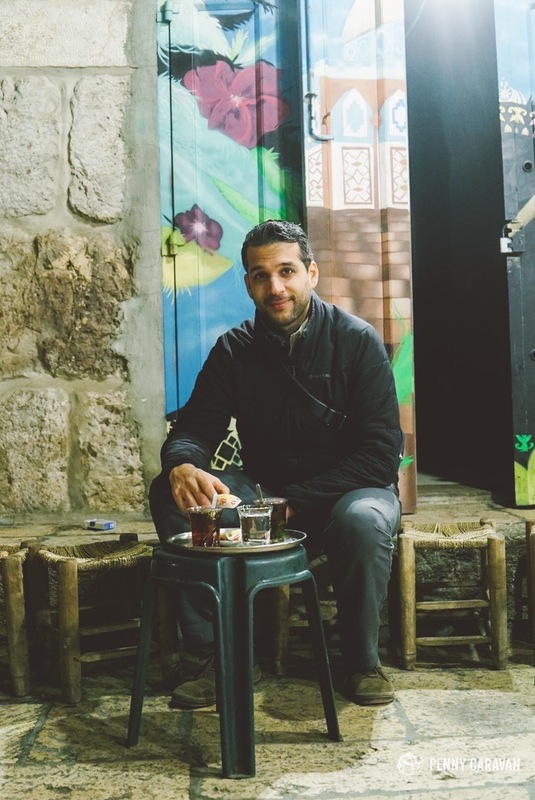 We’re looking forward to a future trip to spend more time in the region, but our short stay was still enough to introduce us to the wonderful Palestinian hospitality, and partake of street treats at bargain prices. Manger Square is lined with several establishments that are good for some tea while observing the goings-on in the square, but none of the food offerings were particular noteworthy. We had much better luck along the streets, sampling sharwama for just 15 shekels and brick oven pizza for 10 shekels. 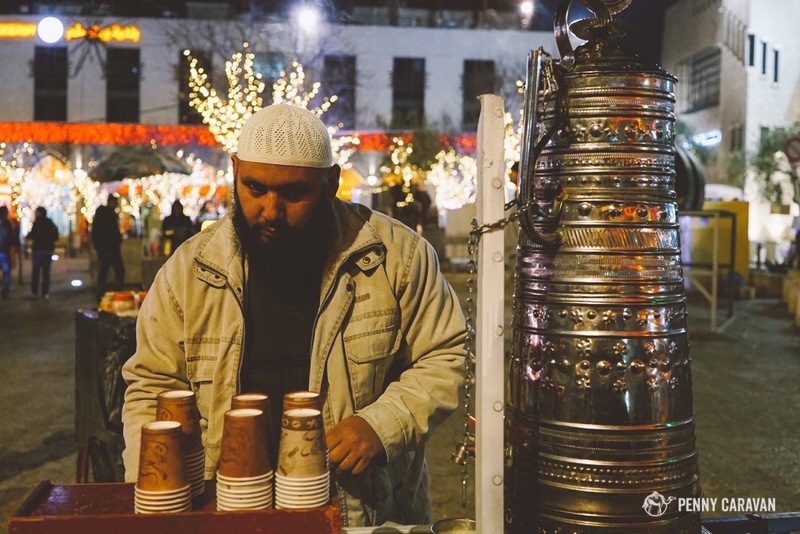 Sahlab, a cinnamon-flavored flour drink with an oatmeal-like consistency was a good way to warm up on a chilly evening. For a sit-down experience, Afteem restaurant just off the square had excellent falafel and shawarma sandwiches. And for coffee and wifi, just look for one of the many “Starbucks” knockoffs. Guy selling sahlab in Manger Square on Christmas Eve. 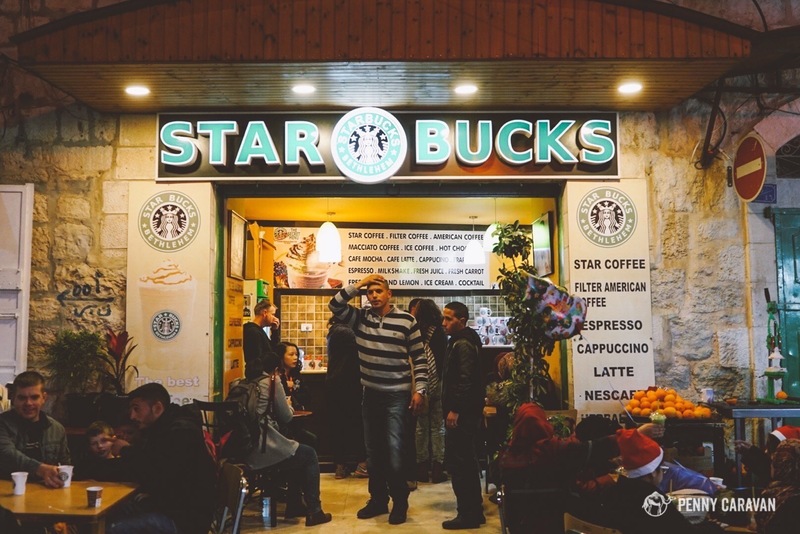 One of several “Starbucks” we saw in Bethlehem. The best falafel sandwich you’ll ever eat is at Afteem!